EDITOR’S NOTE: On September 23rd, Pope Francis will meet with US President Barack Hussein Obama at the White House to discuss global wealth redistribution, increasing illegal immigration and how many billions to spend on Climate Change. 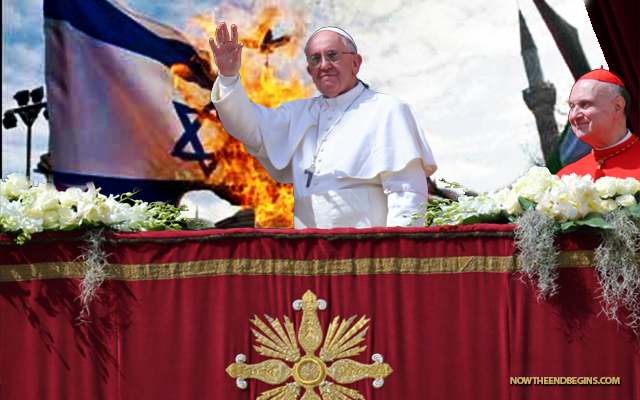 The Pope will also discuss the best way to disarm Israel and make Iran a nuclear power at the same time. The Vatican “values positively this agreement because it considers that the way to resolve disputes and difficulties should always be that of dialogue and negotiation,” Archbishop Paul Gallagher said in a statement. It is clear that the agreement requires further efforts and commitment by all the parties involved in order for it to bear fruit. We hope that the full implementation of [the nuclear deal] will ensure the peaceful nature of Iran’s nuclear program under the [Nuclear Non-Proliferation Treaty] and will be a definitive step toward greater stability and security in the region. Gallagher added, “How are these expenditures consistent with progress towards nuclear disarmament?” The Holy See “has no illusions about the challenges involved in achieving a world free of nuclear weapons,” he admitted, but called for “concerted steps” for all nations to disarm. Gallagher also appeared to single out Israel in calling for “the establishment of zones free of nuclear weapons … especially in the Middle East.” Since 1963, the Vatican has opposed the possession of nuclear weapons, Newsweek reports.